The alarming rise in the number of psoriasis patients is having the most prominent impact on the global market for psoriasis treatment. With the increasing FDA approval for novel drugs and therapies for psoriasis treatment, the market is likely to surge remarkably over the next few years. Apart from this, the presence of a strong product pipeline and the growing awareness regarding psoriasis and its treatment among people in emerging economies are also projected to propel this market in the near future. According to Transparency Market Research (TMR), the global market for psoriasis treatment offered an opportunity worth US$7.8 bn in 2015. Researchers estimate this market to rise at a CAGR of 5.10% between 2016 and 2024 and reach US$12.1 bn by 2024. TNF Inhibitors, interleukin blockers, and vitamin D analogues or combination have emerged as the key products available in the worldwide market for psoriasis treatment. Driven by superior efficiency and safety, TNF inhibitors are reporting a higher demand than other products in this market. By 2024, the segment is expected to remain on top with an estimated share of more than 47% in the overall market. However, the introduction of biosimilars may limit this demand to some extent in the years to come. Interleukin blockers, on the flip side, is projected to present a lucrative growth opportunity to market players over the coming years due to their augmenting usage and their ability to act selectively by targeting the proteins. On the basis of geography, Latin America, North America, Europe, Middle East and Africa, and Asia Pacific are considered as the prime regional market for psoriasis treatment. North America has surfaced as the key contributor to this market and is likely to retain this position in the near future. The remarkable rise in the patient pool suffering from psoriasis is projected to boost this regional market over the coming years. The presence of well-established drugmakers is also expected to have positive influence on the North America market for psoriasis treatment in the years to come. Europe, although currently having a strong position in the overall market, is likely to experience a decline in the demand psoriasis treatment, following an intense competition from biosimilars over the next few years. Latin America and Asia Pacific, on the other hand, are anticipated to witness a significant rise in their respective markets over the next few years. The increasing awareness regarding psoriasis and its treatment among people in emerging economies, such as China and India, through various government and NGO campaigns is projected to stimulate the Asia Pacific market for psoriasis treatment considerably in the near future. Biogen, LEO Pharma A/S, AbbVie Inc., AstraZeneca, Pfizer Inc., Johnson & Johnson, Merck & Co. Inc., Novartis AG, Eli Lilly & Co., and Amgen Inc. are some of the prominent players in the global market for psoriasis treatment. This report on the Psoriasis Treatment market analyzes the current and future scenario of the global market. Approval of new biologics, increase in access for the treatment in developing market, increase in the number of psoriasis patients, are boosting the growth of the global Psoriasis Treatment market. Increase in the incidence of Psoriasis and skin disorders, and novel pipeline drugs are some of the factors expected to drive the growth of global Psoriasis Treatment market during the forecast period. The Psoriasis Treatment market report comprises an elaborate executive summary, which includes market snapshot that provides information about various segments. It also provides information and data analysis of the global market with respect to the segments based on products, distribution channel, therapy type and geography. A detailed qualitative analysis of drivers and restraints, and opportunities has been provided in the market overview section. Additionally, the section comprises Porter’s Five Forces Analysis to help understand the competitive landscape in the market. This section also provides market attractiveness analysis in terms of geography and market share analysis by key players, thus presenting a thorough analysis of the overall competitive scenario in the global Psoriasis Treatment market. In this report, the market segments have been analyzed based on availability of approved products, cost-effectiveness, and preference for technological systems by physicians and patients. The market size and forecast for each of these segments have been provided for the period from 2014 to 2024, along with their respective CAGRs for the forecast period from 2016 to 2024, considering 2015 as the base year. Based on product type, the market has been segmented into TNF Inhibitors, Vitamin D analogues or its combination, Interleukin Blockers and Others. Interleukin blockers segment is likely to be the most attractive segment in the near future due to its increasing use and its ability to act selectively by targeting the proteins. The segment is expected to grow at a highest CAGR rate during forecast period. 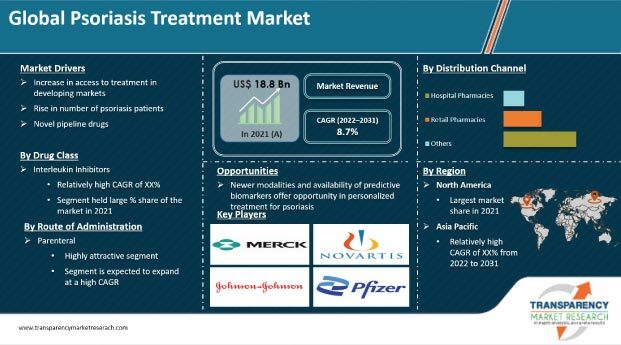 Based on Therapy type, the global Psoriasis Treatment market has been segmented into Topical Therapeutic Drugs, Systemic Therapeutic Drugs, Combinations of therapies & others. The market segments have been extensively analyzed based on increase in demand for the therapies, availability of the drug products, and cost of therapy and severity of the disease. Different types of distribution channels are responsible for making the psoriasis treatment available in the market. The distribution channels are Hospital pharmacy, Retail pharmacy and the online sales. Under the distribution channel segment, hospital pharmacy plays a major role followed by retail pharmacy and online sales. Geographically, the global Psoriasis Treatment market has been categorized into five major regions and the key countries in the respective region: North America (U.S. and Canada), Europe (U.K., Germany, France, Spain, Italy, and Rest of Europe), Asia Pacific (India, Japan, China, Australia & New Zealand, and Rest of Asia Pacific), Latin America (Brazil, Mexico, and Rest of Latin America) and Middle East & Africa (South Africa, Saudi Arabia, and Rest of Middle East & Africa). The report also profiles major players in the global Psoriasis Treatment market based on various attributes such as company overview, financial overview, product portfolio, business strategies, SWOT analysis, and recent developments. Major players profiled in this report include Amgen Inc., Eli Lilly and Company, Novartis AG, Merck & Co., Inc., Johnson & Johnson, Pfizer, Inc., AstraZeneca, AbbVie Inc., LEO Pharma A/S and Biogen.